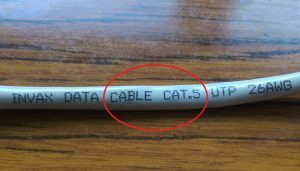 To connect your computer to the internet you need a RJ45 Cable. A 5 meter cable is usually enough to move around your room with your laptop. You mistakenly took an ISDN cable from the “random cable box”. Those are usually thinner because they contain only 4 leads, instead of the necessary 8. Your cable is very old and has been bent or twisted and one or several of the wires inside are broken.